Names in Inventory of the Estate of John S. Magruder 1825. Prince George’s County Register of Wills (Estate Papers) 1789-1831. Estate Papers of John S. Magruder. MSA C2119-60-3. Bill (30), Washington (26), Basil (24), Ambrose (23), Gibbs (22), Harry (20), Frank (18), Manuel (19), Toney (16), Phill (14-elsewhere said to be 11), Daniel (10), Florah (45), Rachel (29), Hannah (20), Esther (18), Mariah (13), Eliza (13), Sall (8), Milly (3), Mary (15 mos), Adam (6 mos). In addition to names and values, the Sales/Distribution of Slaves from the estate also records to whom each person or family was transferred. John S. Magruder had changed his children’s names to McGregor, so we see here N.M.McGregor (Nathaniel M. McGregor), R.M.McGregor (Roderick M. McGregor), Ellen McGregor, Henry M. McGregor, and Mrs. Magruder. Sales / Distribution of Slaves from John S. Magruder's Estate 1825. Prince George’s County Register of Wills (Estate Papers) 1789-1831. Estate Papers of John S. Magruder. MSA C2119-60-3. An adjustment in the accounts of the estate show us that Harry was sold (presumably outside the family) for less than his appraised value. Flora, the oldest person listed in the inventory, is also missing from the sales list. The other missing names appear to be members of Bill’s and Ambrose’s families, though it is not easy to identify family groups. Comparing ages, plus what is known about William (Bill) Bowie’s family from later documents, I’m assuming Hanna (20 yrs old and not on the sales list) was the wife of Ambrose (23), and that the youngest two or three children were theirs. Taking the inventory appraisals as a guide, we can piece together something like this: Ambrose 350 + Hannah 225 = 575 + Milly 75 + Mary 50 + Adam 30 = 730. “Ambrose & family” appear in the sales list with a value of $725, so this looks like a likely family, passed together to Roderick McGregor in 1825. Given Hannah’s age, the older children are not candidates. This, of course, doesn’t leave 4 children for Bill—by which I mean children who are not separately valued and distributed on the sales list. I can’t help noticing, however, that despite that “4” on the list, Bill 350 + Mariah 175 + Eliza 175 = 700, which is shouting distance from the figure of $775. 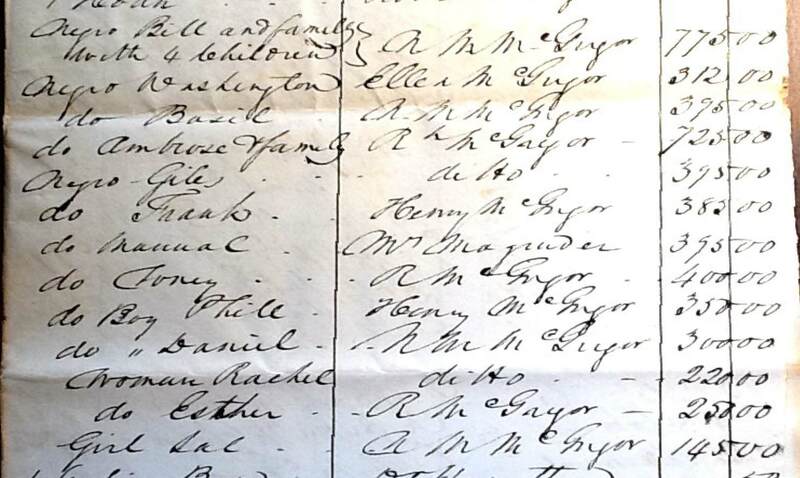 All other children are listed and valued separately on the sales record, so this looks likely to be the family unit (perhaps just part of Bill’s family) passed to Nathaniel McGregor in 1825. It’s also possible that Daniel (10) and Sal (8), who also passed to Nathaniel, were Bill’s 3rd and 4th children. If I read this list knowing nothing else about these families, I would tend to think Rachel (29), who also went to Nathaniel, was Bill’s wife. And it’s possible she was, though he is known to have had a different wife, named Matilda, at least by 1839. See William & Matilda Bowie page for more discussion of that family. See George Washington “Wash” Magruder for more information on Washington and his family. See The Will of Roderick McGregor for more information, including surnames, for others on this list.